On Wednesday, April 25, the Community Center for the Performing Arts held its annual Membership Meeting at the WOW Hall. This year 51 of the organization’s members attended the meeting. All of the members received a meeting packet, which is summarized here. Members can obtain a copy of the packet by visiting the office or requesting an electronic copy by email. The meeting began with a minute of silence for board member Jim Showker, who recently passed away after a long battle with cancer. Preserving and operating the historic Woodmen of the World Hall as a multipurpose community arts center. Maintaining a supportive environment for local artists and their creative efforts. A review of the current fiscal year included a Register-Guard produced video of the Senior Talent Show and a documentary project, WOWSVILLE, produced by a group of UO students. The current state of the Hall’s finances (July 2017 through March 2018) shows a total contributed income of $34,453 vs budget of $109,426. The large discrepancy is because a large number of grants were included in the budget that either were not applied for or not received. Members contributed $24,750 so far this fiscal year, which is $570 over budget. Earned income stood at $396,393 vs a budget of $429,629. Because expenses are often tied to productions, expenses were also less than budgeted ($442,153 actual vs $536,848 budget). Still, the total net revenue after expenses is a negative $11,307 (not including depreciation). Three months remain in the fiscal year, with April and May having a lot of shows. CCPA by-laws require the membership to approve the budget for the coming fiscal year. Treasurer Marjorie Bridges presented a budget that projected $385,000 in Gross Event Revenue out of a Total Income of $650,109. Production expenses were budgeted at $267,281 and Operating Expenses at $372,692 for a total of $639,973. This would result in a net gain of $10, 136. 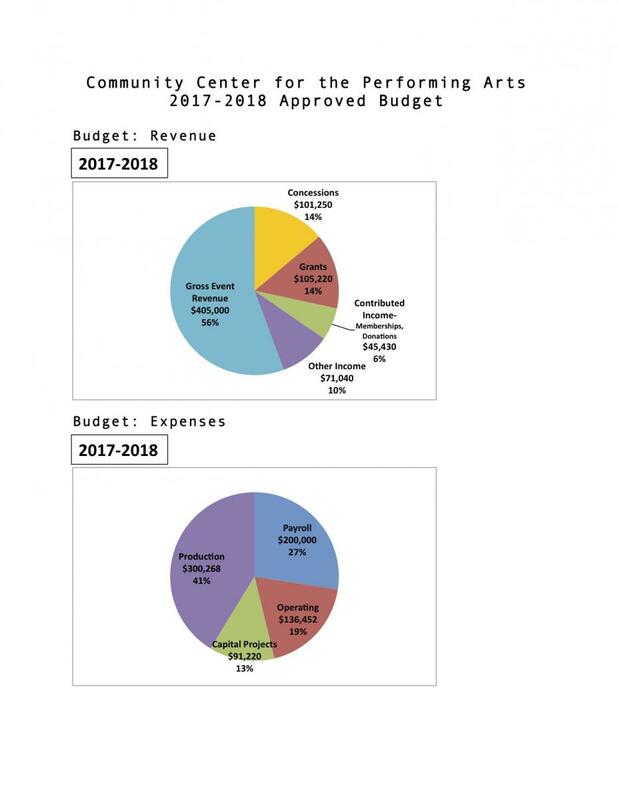 The budget included bracketed items in both the income and expense categories for a General Manager position, which is largely dependent on grant funding. This year Capital Projects budget was presented as a separate item. The budget included $6,805 in CCPA funded projects, $28,500 in current grant and donor-funded projects in progress and $86,250 in proposed grant and donor-funded projects. After a brief question and answer period, the membership approved the proposed budget by a voice vote. Jon Silvermoon, current chair of the Fundraising Committee, explained that the CCPA would stand a much better chance of obtaining a grant for GM funding if the organization could show community support in the form of matching funds. Members present received pledge forms that would only be called in if the grant applications were successful. Nominations were called for to fill a total of six seats on the board. Five would be full two-year terms and one would be to complete the term of board member Jim Showker. Nominated and seconded (and nomination accepted) were: Abe Nielson-Sword, Calyn Kelly, Charles Peters, Dan Wathan, Hans Eichinger, Henry Weber, Janelle Krinsky, Kathleen Blair, Marjorie Bridges and Sam Harmon. After a short break to create ballots and speeches by the candidates, the election was held by secret ballot. Elected to two-year terms: Abe Nielsen-Sword, Calyn Kelly, Henry Weber, Janelle Krinsky, Kathleen Blair. Marjorie Bridges was elected to complete the term of Jim Showker. Congratulations and a big thank you to outgoing board members Daylon Sloan, Jon Silvermoon, Jordan Cogburn and Mike Janes, and to all willing to serve on the board. Because of the late hour, committee and staff reports were presented in written form only. Time was allotted for public comments. One member objected that the comment period came too late to influence the people considering running for the board. c) Danette Lamson as Office Manager. d) We also transitioned Jaley Osuna from VC/AHMS to be the primary House Manager. 2. PAC - Executed another successful year of the performance appraisal process (implemented in 2015/2016) and awarded $3,000 towards staff bonus. The Fundraising Committee has focused on preparing grant proposals to fund a General Manager position. It has also attempted to monitor efforts to raise funds for historic preservation purposes without the committee’s involvement. 1. Street Lamps! We had a formal ribbon cutting ceremony in April for the first two lamps. A plaque was mounted on the lamp that is positioned directly on the corner of 8th and Lincoln. Pioneer donors names are now displayed on the pole. The Register Guard covered the event and there was an article in the paper (both online and actual newspaper). 2. Exterior Restoration: Jon Pincus has led restoration projects on the outside of the building and has helped raise additional money to fund those projects. Repairs include work on the windows on all sides of the building. 3. Danny and Eric are doing great taking care of building and the property. The work includes repairs to the outdoor area, including a new steps in the smoking area and gravel filled in the parking lot. Volunteers have come in to help around the facility this year, including painting the rainbow fence. The awesome dance floor has been refinished twice this year. 4.An update on the Big Leaf Maple trees outside: We are working with the City of Eugene and Treecology to save the trees. We are currently waiting until the trees “fully leaf” before Treecology comes on site for final analysis of the sonic tomography report that was done a few months ago. This fiscal year beginning July 1, 2017 has had an $18,789 decrease in net revenue so far. We expect net increases in April and May to help end this fiscal year with less of a loss, however, we do expect to end the year with about an $8,000 down. Grants and other fundraising are $6000 below budget. Ticket sales are $12,851 below budget and concessions are $12,560 below budget. Rental income is also down. We expect to see steady improvement as our new employees gain experience. We would like to thank our members for your continued support. With the basement concessions, everything has been running smoothly with a fantastic crew. Angela has fully trained Kami and Danny, and now we have a rotating crew of three plus a handful of licensed volunteers. We worked with the OLCC to throw private parties upstairs and all events were incident free. We have consistently received 100 percent on our health inspection for five years now. Kami ordered WOW Hall stickers that we now sell in the office, at the snack bar and in the basement. In addition, Kami has been Internet shopping for in-kind donations. She got a sofa donated for the basement and furniture for the Green Room. The WOW Hall office has had some changes and more are coming. Ross Schuber, who has served has publicity assistant going back eight years and office manager for five, has moved on to another job and left some big shoes to fill. During his time here, the job of office manager evolved in many ways. The OM is responsible for ticket sales, poster service management and assisting the booking coordinator, publicist and bookkeeper. Facebook event listings and posts, which we used to do as an extra, are now expected and required by most contracts. Ross did almost all of the WOW Hall’s social media as well as targeted Internet advertising. He was very active and creative in getting people to share our events. Of course the main job of the office manager is to sell tickets. Only nowadays, most ticket sales are not done in the office but via Internet. The office manager coordinates event announcement and sales with the artists and Ticketweb. Ticketweb now accounts for most of our ticket sales, and last year Ross got a new three-year commitment from them to be our online ticket service. They gave us a $35,000 signing bonus (up from $20,00 in 2014). Poster service management can be a challenging unless one has developed a dependable crew. One of the main reasons our poster crew has been so dependable is that our other office manager, Zac Townsend, does half of them himself. He covers about half of the office hours and serves as publicity assistant. Sadly, we will soon be losing his services as well. Zac will be leaving for Europe later this spring and plans to begin a new career there as an English-as-a-second-language teacher. Our new office manager, Danette Lamson, has twenty years of office experience including at the Ebbert Memorial Church in Springfield. She also is a founder and board sectary for the nonprofit Ann’s Heart supported housing. “This past year at the WOW Hall I have found myself wearing three different hats and for a few months all three at the same time,” reportsd Jaley. April-Sept as the Assistant House Manager; Sept-Dec as the Volunteer Coordinator/Asst. HM; Dec-Mar as the House Manager/VC/Asst. HM. The Assistant House Manager position has continued to ease the burden on the House Manager during shows with attendance of 200 or more. Assistant House Manager is another set of eyes for security issues and available to help with custodial needs when they arise...and they do. The Volunteer Coordinator hosts a volunteer orientation every month. This winter we worked with Looking Glass for a successful work experience/internship program and we hope to work with them more often. Security needs are getting dialed in and we are staffing more shows with our own volunteers and saving costs on outsourcing. Outsourced security is a must for some shows, which happens with the help of Guardian Security. Will call lines are moving faster with the implementation of multiple lines, will call ticket preprinting and expert help from the Assistant House Manager. Gender-neutral bathroom signs have been hung in the Hall to maintain a healthy and safe space for the community members who come to the WOW. In the maintenance department we have had multiple projects to work on. The back parking lot had holes that would fill with rain and this would make it harder for bands to load in gear. Over the last year we have set up and torn down many shows and all of them have had few to no problems in any production aspect. We have continued to expand our lighting show with the purchase of new spots and a touch screen laptop. We expanded our compressor rack with the purchase of a used DBX project 1 compressor. We also replaced our FX processor with the much quieter and more intuitive Lexicon MX200. For monitors we have gotten two ART HQ-231 stereographic equalizers that allow us to find and squelch any feedback more quickly and easily than before. We have trained several people to stage crew and are training more. The production staff that can be called on to work shows has more than doubled over the past year. Almost all the new people started by volunteering and working at either monitors or lights until they gained experience. All of us on the production staff look forward to continuing to grow our area and delivering more great shows. Programming highlights for 2017/2018 included returning favorites like Buckethead, That 1 Guy and Pigs On The Wing as well as sold out shows with new acts such as SZA, Kishi Bashi and Brockhampton. We also launched a regional 2-piece music festival, Dyad, and resurrected Cafe WOW. The year also saw collaborations between the CCPA and The Oregon Historical Society, Lane Arts Council, KWVA, KEPW Community Radio, Network Charter School, as well as the University of Oregon. Via grant funding through Lane Arts Council, we threw Noche De Musica Latinx, and event featuring modern cumbia, Latin psych, and traditional San Jarocho music and dance. We also added daytime classes and events such as an Instrument Petting Zoo, Irish Music Workshop, Senior Talent Show, Cannabis Horticulture Workship, and OSLP Drum Classes. Our Programming Manager took on two UO interns, helping to fulfill our duty of educating future community leaders and strengthening the connection between the CCPA and campus. The immediate future sees more community outreach and collaboration through a revised Rental, Co-production and new Community Partnership event structure. The goal is to keep the WOW Hall affordable and accessible to the community. The Community Center for the Performing Arts hosted the WOW Hall Annual Membership Meeting on Wednesday, April 12, 2017. Ninety-one members gathered to approve the organization’s policy statement and budget, and to elect members to the board of directors. This is more than double the previous year’s attendance. Thank you to Mezza Luna Pizza and Track Town Pizza for their donations to our pre-meeting social. Members were presented with a comprehensive, 37-page written report (available at the WOW Hall office) that includes Staff Reports, Staff Management Report, Profit & Loss Statement, Revenue and Expense grafts, Reports from the Facilities, Fundraising/Education and Personnel Committees, Proposed Budget and Capital Budget, and Organization Goals. Staff Area Reports: Concessions managers Angela Lees and Shawn Lynch have added Kami Morris-Mitzner to their crew. Things are running smooth with the new coolers, a new kegerator and floor mats purchased with a donation by Craig Lawrence (& matching grant). Publicist and Membership Coordinator Bob Fennessy thanked the publicity team (James Bateman, Ross Shuber, Zac Townsend & the poster crew) and pointed out that all WOW Hall members were part of the Publicity Crew. Danny Noall was introduced as the new head Custodian. He and Assistant Custodian Eric Herz have been working to complete the Interior Restoration Project. Justin Showker was introduced as the new Stage Manager. He introduced Davis Koier (Monitors/Front of House) and Cody Owen (Lighting Director) and spoke of equipment upgrades. Volunteer Coordinator Laura Farrelly oriented 135 new volunteers to the WOW Hall. Volunteers filled 2,166 show positions and logged 6,625 hours in 2016/17. Volunteers are constantly learning on the job skills and teamwork. Bookkeeper Melissa Swan reported an $18,000 increase in net revenue over the last fiscal year so far. A one-dollar on-line ticketing service charge introduced a year ago has the organization on track to break even this year. House Manager Sam Harmon introduced new second HM Jaley Osuna. They have been working on procedures to move people through the door more swiftly. Megan Brezovar was introduced as the WOW Hall’s newly hired Programming Manager. Management report identified the year’s top netting in-house shows as: Aesop Rock, Danny Brown, High Step Society, Isaiah Rashad, K.Flay, Louis The Child, Quinn XCII, Watsky and What So Not. Artistic highlights of the year include Haiti’s Lakou Mizik, The Dandy Warhols, Carl Verheyen, Laura Marling, Xylouris White, Terry Bozzio, Portugal. The Man, Over The Rhine, Wild Child, the NYE Psychedelic Ball, Keller Williams KWahtro, Ladysmith Black Mambazo, Elephant Revival, Adrian Legg, Old 97s and Mount Eerie. Educational opportunities included monthly volunteer orientations, Girl Circus, two Music’s Edge Summer Rock Camps, Bass Camp, Dance Empowered, Ecstatic Dance, West African Dance and Drum, and the new WOW Wellness Collective and Self-Defense Class. Community partnerships include City of Eugene, UO, Lane Arts Council, Whitaker Block Party, OSLP Arts & Culture Program, Edison Elementary, Network Charter School, Gateways High and the Women’s March, which may have been the WOW Hall’s single largest attendance day, ever. Bob Fennessy presented the Staff Report and thanked Calyn Kelly for his service as stage manager, sound engineer and program manager. He recalled how Calyn stepped in and volunteered to do booking after a previous manager left unexpectedly, and has continued to do so even after starting another job in January. In the past, people who have made exceptional contributions that saved the WOW Hall in a time of crisis were made lifetime members, and the staff recommended that Calyn be so honored. The audience voiced hearty agreement. Treasurer Jon Silvermoon presented the Financial Committee report. The CCPA’s current Profit & Loss statement shows a current net loss of $6,349 for the fiscal year with three months remaining. Jon expressed concern that seven of the ten previous years had shown a net loss. The Facilities Committee report was made by Aaron Dietrich and Jon Pincus. The Interior Restoration Project is ongoing including wall and woodwork finishes and a new vinyl floor in the original tile pattern. Engineering and construction were achieved for two authentic historic streetlamps (with two remaining) with funding provided by the City of Eugene and private donations. The south side windows will be repaired with a City of Eugene Historic Restoration Grant. Mike Janes reported that the Fundraising/Education Committee focused on grant projects, developing a Multicultural and Educational Programming project and making applications to the Lane County Cultural Coalition and Coquille Tribal Community Fund. The applications were turned down but the organization was encouraged to reapply. Mike thanked the Lane Arts Council for a grant award of $6000. Over the coming year the committee will work on a Capacity Building/General Manager Project, Community Education/Awareness and other fundraising. The Personnel Committee, also chaired by Mike Janes, has worked to define job descriptions, make changes to staff wages and payroll process, and continue the staff performance appraisal process begun last year. The Board of Directors presented a recommended Budget for 2017/18 of $727,940 that was broken down into $427,000 Operating Expenses and $300,268 Production Expenses. When someone asked why the budget was $100,000 more than the previous one it was explained that $93,220 in capital projects was included in the budget but could not be spent unless the funds applied for were actually awarded. The budget was approved. Next up was the Public Comments section. Many in the audience voiced a desire for more opportunities for local acts to play the WOW Hall. Also suggested were: LED stair lighting, more diversity of age & demographics, advance statements from candidates & absentee ballots, basement shows, finished mural, promote the Cultural Trust, staff/board retreat, talk to growers about donations, better ventilation downstairs, rent Kesey Square to put on events for donation, bake sales/car wash/raffle, road signs with schedule, add to reserves, make space for organizing/movement stuff. Nominations were then taken for the Board of Directors. With six seats up for election, the vote would determine four two-year positions and two terms of one year. An unprecedented 16 members accepted nomination to the board (although one later removed himself from consideration). The candidates were: Aaron Dietrich, Bryan Calza, Hannah Finley, Heather Kliever, Holly Caswell, Jim Showker, Jon Mathison, Jona Waterstone, Jordan Cogburn, Marjorie Bridges, Marlene Monette, Mike Franklin, Rachel Thiesmeyer, Steve Lasky and Tim Mueller. As each candidate made their acceptance speech and spoke of the love they had for the WOW Hall, it became abundantly clear that the organization had a wealth of community support that was strong and deep. When the votes were tallied, Aaron Dietrich, Hannah Finley, Jim Showker and Marlene Monette were elected for two years. Jordan Cogburn and Marjorie Bridges were selected to fill the remaining year of two uncompleted terms. The next Board of Directors meeting will include election of board officers. All CCPA board meetings are open to the general public. The WOW Hall Annual Membership Meeting was held on Wednesday, May 11, 2016. Forty-five members of the Community Center for the Performing Arts gathered to approve the organization’s policy statement and budget, and to elect members to the board of directors. A pre-meeting social featured pizza donated by Mezza Luna and waffles from Off the Waffle, as well as potluck food donated by WOW Hall board and staff members. Members were presented with a comprehensive written report (available at the WOW Hall office) that included Staff Reports, Management Report, Profit & Loss Statement, Revenue and Expense grafts, Reports from the Facilities, Fundraising/Education and Personnel Committees, Proposed Budget and Capital Budget, and Organization Goals. Performance highlights for the year include Icelandic folk artists Arstidir, legendary hard rock band Shellac, spoken word from Shane Koyczan, acoustic songwriting from Kimya Dawson, experimental gypsy tinged alt-rock from Man Man, neo classic hip-hop with Blackalicious, independent bluegrass from The Oh Hellos!, Wild Child, Elephant Revival, Mandolin Orange, R&B from The Internet, and more from varied artists such as The Dandy Warhols, Cherub, Yo La Tengo, The Grouch & Eligh, Lucius, Moon Taxi, Ladysmith Black Mambazo, Chicano Batman, International Guitar Night, Lettuce, Shabazz Palaces, Wanderlust Circus, Zion I, Trick Pony, reggae from New Zealand with Katchafire and upcoming French electronic music from CloZee. The WOW Hall also hosts up to seven regular classes per week. Cynthia Healey’s Zumba classes are so well attended that she can hold them three times a week. We also had three summer camps -- two kids rock camps hosted by Tim McLaughlin and Bass Camp. Created by Calyn Kelly, Olive Del Sol and other local musicians, Bass Camp has now been picked up by the City of Eugene Parks and Recreation and is being presented by them in partnership with the WOW Hall. Calyn also hosts periodic workshops in sound, lights and production. Our 40th Year Anniversary show was a great success and ushered in a new tool in our programming that has already enabled return performances with Built To Spill, Elephant Revival, and MarchFourth. Publicist/Membership Coordinator Bob Fennessy spoke briefly and stated that, with or without a financial backer, the CCPA needed to produce one or two sold out shows per month. That, combined with a new $1/ticket on-line service fee (still no fee at the WOW Hall office), should put the WOW Hall back in the black next year. He said that grant support was needed for the WOW Hall to produce the “cultural” shows that everyone says the Hall should have but that are not well attended. Also, that the P&L does not reflect the additional assets of a $6000 soundboard (made possible by a donation from James Bateman) and several thousand dollars worth of new coolers. Melissa Swan, the CCPA’s new bookkeeper as of July 2015, presented the Financial Report. For the fiscal year ending this coming June 30, the CCPA is projecting a net loss of $12,759 (as compared with $14, 944 for 2014-15). Although income from ticket sales increased slightly, figures were lower for rentals, downstairs concessions and grants. Numbers were up for classes, memberships and poster service. The organization currently has $110,706 on deposit, including $52,083 in reserves. The Facilities Committee is continuing work on the Woodmen of the World Interior Restoration Project and the Historic Streetlamp Restoration Project. This year hot water was installed in the bathrooms, new coolers in the basement, big leaf maples were planted alongside Lincoln St., and the Woodmen of the World Historic Exhibit was presented. On tap for the coming year are the UO Archive Project, Iron Railing for the outside staircase, Courtyard Drainage Project, Southside Facade repairs, and numerous minor restorations. The Fundraising/Education Committee hired a new grant writer – Ahava Oblak. Board members conducted a 4th quarter membership drive that recruited 55 new members. The Personnel Committee has completed updating job descriptions – 14 total. PC has developed and implemented a new process for performance appraisals that is goal-based, and hopes to be able to provide staff bonuses. Members were presented with a proposed budget for 2016-17 with a projected income of $627,060 (up from $600,860 15-16) and an equal amount of expenses. The budget was approved with one member voting no and one abstention. Organizational goals for 2016-17 were: 1. Continue Educational Expansion; 2. Reorganization/Staff Support Mechanisms; 3. Restoration and Facility Upgrades; 4. Membership Outreach Enhancements. Nominations were then taken for the board of directors. With seven seats up for election, the vote would determine five two-year positions and two one-year terms. Thirteen members were nominated for the board and eight accepted. After speeches by the nominees the vote was held. Elected to two-year terms were Daylon Sloan, Jacqueline Hamer, Jon Silvermoon, Mike Janes and Terri Wilson. Elected to one-year terms were Aaron Dietrich and Jesieh Love. The next Board of Directors meeting is scheduled for 6:30 pm Thursday, June 16, at the Growers Market Building, 454 Willamette St., upstairs. Business will include election of board officers. All CCPA board meetings are open to the general public.